Since a conversation with my dad in May, I’ve been trying to figure out a good domain name for a new shop, run 100% by me and not a 3rd party, to see my unique custom gifts that I make mostly by hand at. I toyed with several ideas, but never pulled the trigger. I finally found it sitting right in front of me – and I already own it. So, introducing Gifts.TrishaLyn.com! I’ve been attempting to sell my wine charms on Etsy for years, with mixed results. Etsy does provide a good audience of consumers, but doing a competitive analysis of other wine charms on the site I found that many sellers way undervalue their wine charms and the prices are very low – lower than I’d make a profit on and lower than I think they’re reasonably valued at. I’ve also grown tired of continually paying Etsy fees for items that aren’t selling, so I switched my focus awhile back to a second shop on Storenvy. Instead of a quarterly listing fee that Etsy charges, Storenvy charges standard credit card processing fees when a sale is made. If you look just at the fees, I’d much rather pay the fees after I’ve already sold something and have a guaranteed profit. At this point, some of my sets of wine charms have been available on Etsy for so long that the profit is likely long gone. I finally realized that I didn’t need to spend money on a new domain, I could just create a sub-domain on my most personal domain here. I already associate all the stuff I make as Trisha Lyn Gifts, so why not just do that. The last time I set up a sub-domain was on my last web host, so I had to educate myself on how to do it on my new host GoDaddy. Luckily their Installatron makes it easy to install WordPress that already has a popular e-commerce plugin pre-installed that I’ve heard good things about, Woocommerce. 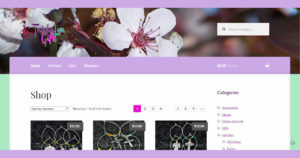 Over the course of about a week, I was able to teach myself some of the ins & outs of Woocommerce – using attributes, connecting it to my business PayPal, picking a Storefront child theme, you name it. It’s not a polished merchant site ready to storm the world, design wise, but the products are there and I’ve already made a sale! So what if the buyer was my brother-in-law… it still counts. By and large my new store, still known as Trisha Lyn Gifts, has all of the same items as my Storenvy site but going forward I’ll be adding new items exclusively to my own site and discontinuing my Etsy store. The link in the navigation of this website has already been changed, and I intend to connect the sites by linking to this blog from the shop as well. Setting up my own shop website has improved my skills learning the new plugin and features as well as given me a chance to hone my branding and how I present my items. It’s less of a random whim to sell the pretty things I make and more of a real business. Since I still make a lot of custom items that I don’t offer for sale in my shop, I’ll continue to post those in my handmade gifts gallery here. I also invite you to check out the shop and do some Christmas shopping with me!